The Gamers Hideout scandal will require a lot of damage control efforts because things are going way out of hand. Update: Racial profiling is merely speculation, and most details were told from the viewpoint of the accused. Until we hear the statement from both sides, we cannot determine what truly went down. As such, the article has been amended. We are not, nor have we been, accusing Gamers Hideout of being racist. We do not condone racism of any kind, and we apologize to anyone that we’ve offended. 2nd Update: It appears that Holy Chit’s Facebook has disappeared. We’re not sure what caused the disappearance nor why but we’ve amended the link to his Facebook post with an archived version. Whenever there’s a videogame retail store nearby, we gamers find it hard to resist to drop by the shop and take a look. Whether we have money to spend or not, just being inside and thinking about our next purchase is a joy in and of itself. However, imagine if you’re just looking around at a videogame retail store and suddenly one of the workers accuse you of stealing their merchandise. It would instantly spoil your day, wouldn’t it? Well, that’s apparently what happened in the recent Gamers Hideout scandal. Gamers Hideout Scandal: What Happened? Surprised and caught off-guard by the manager, he simply asked when he did such a thing as he was completely clueless on what was happening to him and his friend at the time. The manager apparently became agitated and threatened to call the police on the matter. The group of friends weren’t allowed to exit the store and were forced to wait for the police to arrive. They then watched the alleged CCTV footage of what the manager believes to be someone from the group stealing a copy of a game. He became angry and the person in the CCTV footage does not resemble him nor his friend Harits Azahar, who is also accused of wrongdoing. Upon confirming the date of the CCTV footage (22nd February 2017), Holy Chit showed proof that he was not even remotely near to 1 Utama Shopping Centre and that in fact, he was at Central Festival Mall in Setapak with his girlfriend via a chat history timestamp. This was not enough to convince the manager. Upon the police’s arrival, all of the accused’s personal identification cards were collected and the investigation began. After submitting the CCTV footage to the police officer, the manager was asked who he believed was the perpetrator, which is when the incident became even more confusing. The manager pointed to a different person instead, someone who is allegedly staying in Ipoh and has only reached the Klang Valley area the day before the Gamers Hideout incident occurred. When the police asked for a final confirmation on the perpetrator, the manager apparently became uncertain. The only thing that was certain at that point was that the thief purchased a game and stole another game when the theft occurred. To prove his innocence, Holy Chit gave his Gamers Hideout membership card to show that he was not present on the day of the theft, and surely enough, it was true. Coincidentally, the thief’s name is close to Holy Chit’s real name, albeit with a different spelling so the police did not count it as evidence linking him to the crime. Another thing that piqued the policeman’s curiosity is why the manager, or anyone managing the operations of the store on the day of the incident, did not make a police report about it. The manager apparently could not give an answer. The policeman then requested that the manager, as well as the accused party, to follow him to the investigation room. The manager declined, citing staff shortage and a high number of customers visiting the store as reasons to not go. Instead, he sent his off-duty supervisor to follow the policeman. In the investigation room, the supervisor showed the CCTV footage once more, and the policeman allegedly laughed at it as it did not look anything like Holy Chit and his group of friends. Soon enough, the group of friends were free to go. Holy Chit then posted the entire incident on Facebook, which has since gone viral. Keep in mind that this incident has only been told from the side of the accused. We have yet to hear from Gamers Hideout themselves. 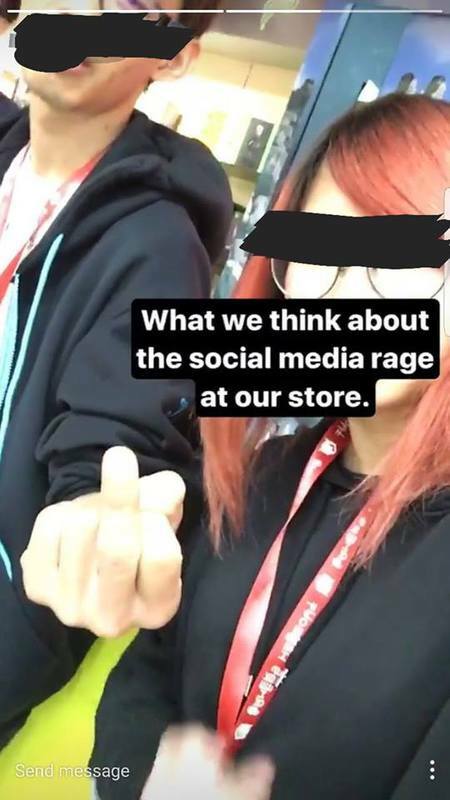 One thing’s for sure, this Gamers Hideout scandal has caused quite a bit of uproar on the internet, and has drawn the rage of netizens. The retailers’ image has been damaged, but until we hear an official statement from them, we cannot say for sure how legitimate the story is. We will update this article as soon as we hear something from Gamers Hideout or any developments that come from this story. Pokdepinion: If the CCTV footage truly shows a person that has a different look from the accused, this could possibly be a case of racial profiling by the manager. In which case, this is very unprofessional, and the Gamers Hideout scandal will truly damage the retailers image to oblivion. This is mere speculation however and should not be taken as fact however, and since we have yet to hear from Gamers Hideout, it’s best for me to not speculate on the matter further as it might cause unnecessary issues down the line. We are not, nor have we been, accusing Gamers Hideout of being racist. without even knowing the other side. right? (the day the stuff was stolen) and did you took the other game? aboutT line from an innocent person? Hi, thanks for sending us what happened on GH’s side. As we mentioned in the article, what we wrote is simply a story from one side, and that we were waiting for GH to make an official statement. We are not accusing GH for being racist, as we are simply re-telling the story according to the information that was available at the time. As soon as GH makes a public announcement on the matter, we will either update this article or create a new one. We believe that we need to provide the story from both ends after all. GH did not even bother to make official statement about this incident..
summore GH staffs posted this earlier and has been taken down..
Hello! Can you write your message properly?! I cant understand any of your Ah Beng type of language. Thank you. Papa bless. Ching chong ping pong sing song ding dong! apa khinzir punya english ni. Ladies and Gentlemen, this is an example of people who supports GH. Their English makes no sense and they don’t read numbers very well. Go back to school and get an education in English. Thanks for the aneurysm dood. Don’t blame he..He nick also say “annoy” from starting..
Ingat gamers poor sangat kah? Why the manager GH dont even make a police report on the day the game has been stolen..? I know the owner of the store and the manager Jason. They are great people who show respect to the most clueless person who walk in there. This is clearly biased telling a one sided story. As we have written in the article, this is a post written from the perspective of the victim. We have still yet to hear from GH themselves after all. Maybe the manager got drunk? Or maybe he was depressed. Or maybe he really thought it was that guy who stole it but was mistaken. Whether it’s biased or not, if the person was innocent, who wouldn’t be angry of being accused of something he didn’t do? Better wait for an unbias statement. I agree with Aeizzah. I know the manager Jason too. I used to be an avid visitor to GH and have bought countless numbers of items from them. Aiman did clearly specify in the article that this is the one side of the story and we are only waiting for the statement from GH. If GH does thing their statement can make a change, they can always contact us and we are more than happy to discuss it further. For now, a customer got accused and we just don’t find that appropriate to happen ANYWHERE. If this had happened in any other shops, that shop’s name would have been in place of GH here. To each their opinion just like ours. 1. Why jason didn’t make any police report when the incident happen? Why after 2 months then watch the cctv footage then saw look like thief then straight away report? 2. Why jason didn’t make any statement to clear the one sided story? Got no balls? GH with their bad service since many years ago, haha. all staff ah beng talking style, not professional, and always look at customer like a criminal. Tag Heuer Connected Modular 45 announced, Intel Atom-powered smartwatch, anyone?